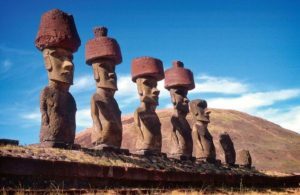 In the middle of the south Pacific, two thousand miles from anywhere, a Dutch explorer named Jacob Roggeveen came upon a strange sight – a small island ringed with huge, weird moai – gray stone statues which looked like primitive heads. Some were more than 30 feet tall, many with red topknots. One moai, never finished, would have been almost 70 feet tall and would have weighed about 270 tons! Roggeveen estimated that about 2,000 to 3,000 people lived on the island, and he made that number smaller by shooting a few of them. 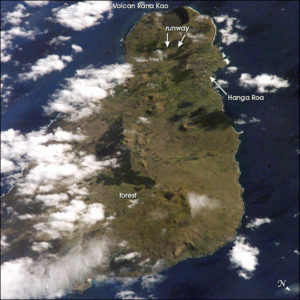 He named the tiny, 63 square-mile volcanic island Paasch Eyland, because he and his men landed there on Easter Sunday, April 5th. They stayed about a week and it was almost half a century before the natives had another visitor. 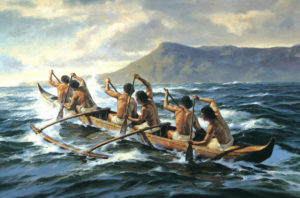 Chile annexed the island in 1888 and kept the name, Isla de Pascua in Spanish. The statues of Easter Island have generated immense interest, as have the original setters. When did they come? Who were they? 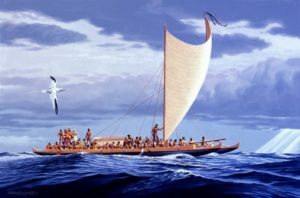 They arrived between 700 and 1100 AD and were Polynesian, but why the red topknots? Were some of them Vikings? They thrived, having a population as high as 15,000, but in time, 21 species of trees became extinct, as did all land birds except chickens, and the population fell to 111 in 1887. Today, 60 % of the 6,600 inhabitants are descendants of the original settlers. In 1995, Easter Island was named a UNESCO World Heritage Site and tourists, some 50,000 each year, come to see some 900 restored and resurrected statues. So Happy Easter, Easter Island! Thank you for sharing the link to Jared Diamond’s Ted Talk. It was very interesting. I hope everyone gets a chance to watch or listen to it.